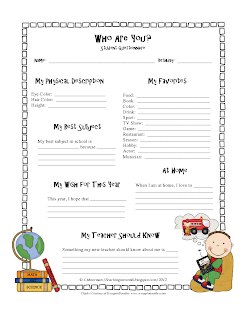 At the beginning of last year, I asked my students to fill in a "get to know you" questionnaire as they entered my room on the second day of school. On it, I had some personalish (I know that isn't a word, but I am feeling rebellious today ;) ) questions such as list your favorite food, what is something I should know about you, what you do at home, etc...The purpose of this was just to give me a little insight into the CHILDREN that my new students were. Here are a few of them. Now, you might be asking, what does this have to do with anything? Well, let me tell you, I actually did use these for something! 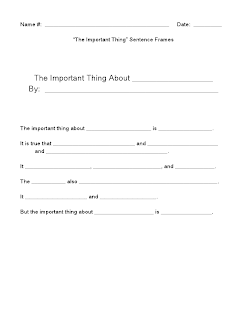 At the end of the year, for my parting "gift" to my students, I used them to help me write "The Important Thing" pages for them! If you have been following my blog from the beginning (or even have just read back to the first few entries) you will know how much I love The Important Book . I do so much with it, from learning about reference books, or just writing letters to people. It truly is an amazing book to use in the classroom. Since we had been using it so much in class, I thought it fitting to create an "Important Book" page for each student to remember their year with me. "The important thing about ______ is that she is an amazing friend to everyone." "The important thing about ____ is that she is an amazing friend. It is true that she studies hard in math and loves to play games online and enjoys crawling around with her brother. She likes things that are hot pink, is a great speller, and could play basketball all day. ______ is allergic to nuts, but not pasta and loves to go to Harns Ranch to eat. She also a wonderful class participant and a great partner to have. But the important thing about _______ is that she is an amazing friend." I can't tell you how ECSTATIC my students were to get these. The smiles were a mile wide...one even started to cry! I think because we had given so many of these to our volunteers and other people, they never entertained the idea that they would get one about themselves. It truly was a great end of the year gift for them. And best of all, it cost me nothing. Here are a few documents for you, in case you want to do something like this next year. First off, I made my cards on Vista Print, but here is a sheet for you to use. Then, here is the sentence frame for the Important Book that I used. And that is it. I know this takes a bit of planning (I mean, you do have to have the students fill in the cards at the beginning of the year and hold on to them!) but the smiles and reactions from the kids were well worth the effort! What a great idea! That could mean the world to certain students. I can't wait to use this in my classroom! That idea made my heart smile. Can't wait to use it, either. Wonderful idea! I was just about to ask you if those are from Vistaprint! Great idea & you just gave me another idea on how to use those kinds of cards! Thanks for sharing! I am getting ready to start teaching in October (I know, right! 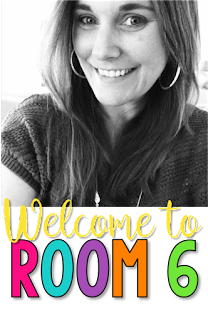 ), and this will help tremendously to get to know my students. Thank you! That is so cool! I think I will try that this year, but with 100+ kids and constant moving in and out of the school it will be a big task. Maybe my team will help me tackle it. Thanks for the idea and the forms. COOL, Stephanie!!! I really like this idea! Hope your week is great and not as hot as mine!!! Thanks for the download. You're so generous. :) I try to write goodbye letters to my kids too. I love it when I think we THINK alike...I've become one of your biggest fans. Thank you so much for a terrific idea! I've done something similar, based around the poem, "Everybody Needs a Rock" by Byrd Baylor. The kids find and decorate a rock, then introduce themselves as they put it in a basket - where it stays all year. At the end of the year, I ask the kids to write something positive about 3 -4 others in the class. I work it out so everyone gets 3 or 4 others to write about them. I write something similar to what you wrote (only not quite so elegant) using the ideas from the class. We also write something for any student who has to leave mid-year, only then I ask everyone to contribute. It would be very easy to combine these two ideas, using input from the class as well as information from the child. That sounds like a great book! I will have to pick up a copy for myself to incorporate it into my first week plan. Very cool and a great idea. This is something I can incorporate into the video I do at the end of the year. Last year, I used baby pics to their current pic. This year I had them do a quote into their current picture... This would be a totally different thing to do to make it special! I LOVE this! Like others have said, thank you so much for your generosity in sharing your downloadables (I'm feeling rebellious too ;0) ). I can't wait to use this with my 5th graders this fall :0). Love this questionare!! I definitely going to be using this with my 6th graders!! Love it! Once again you have taught me something! Thanks! I plan on using this. You're awesome. I can't wait to read all of the rest of your posts. Thanks for sharing your Important Book sentence frames. I use The Important Book to work on main ideas and supporting details but the sentence frames I have from Interactive Read Alouds don't provide as much details which some of the students need to push themselves a bit further. I'm definitely going to use this to help differentiate for the students. This is great! Can't to use this for my children. Thanks for sharing. This is awesome! I used The Important Book last year to have my 2nd graders write a little bio about their name! They turned out so great we published a book of the class. When I get the items together I'll share it! This would be an excellent way to end the year and bring it full circle to the beginning! Thank you! Like I said I will share as soon as I get it all together! I love this so much! Thanks so very much for sharing! Thanks for sharing this great idea and the forms for it! I really appreciate it and look forward to trying this out. I love your ideas. I just found this book this year and used it at Mother's Day to let my 2nd graders write poems to their moms. 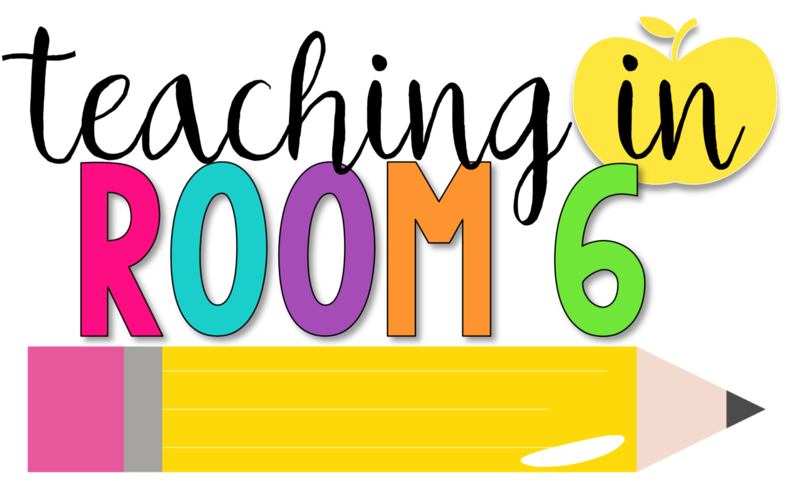 I'm moving to 5th grade and think that this is the best getting to know you idea I've seen since it will be used through the year as they are preparing to move to middle school. THANKS! What a cute share! So sweet! Hi I was wondering if it would be ok with you if I translated these things into spanish? I have loved so many of your ideas but I will be teaching spanish immersion 3rd grade and would need some of your documents in spanish. Please let me know. Eventually i would like to repost them in spanish. Thank you so much for sharing. I can't wait to try these ideas! LOVE the hands and the word "personalish"!